Greece’s parliament has passed into law mass civil service job cuts – positions that were previously guaranteed for life. This is part of the latest reforms requested from international lenders before the release of the next bailout aid installments to Athens. The multi-bill draft outlining the new policies was endorsed with the support of the three parties participating in the conservative-led coalition government with 168 votes in favour during a vote in the 300-member strong assembly. The new law opened the way for the layoffs of some 15,000 civil servants by 2015, including 4,000 this year, in an unprecedented step in Greece, since job positions in the public sector had been guaranteed for life constitutionally for decades. 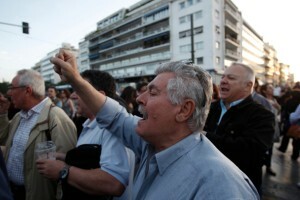 Greece’s unemployment rate currently stands at 27 per cent. Shrinking the public service is a condition set by Greece’s creditors – the International Monetary Fund (IMF), European Union (EU) and European Central Bank (ECB) – to unlock loans amounting to $11.4 billion. Hundreds of people turned up outside the parliament to protest against the measure in a demonstration called by trade unions.